Want your own psychopathic crazy text? 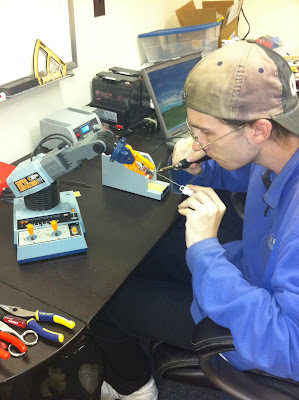 http://www.textozor.com/ serves all your smudged and blotted needs. So, a lot of my associates are Windows users out of necessity. "Our pc's fans started goin off again on full blast. We already did the virus detection and surprisngly it found viruses and deleted them. But today it started on full blast again. Any ideas?" There's some .PDF, Flash, and JAVA vulnerabilities going around now; make sure you patch up your Adobe Reader and Flash Player to current, Update your JAVA to 6u22 or higher, run TFC.exe and then run a malware bytes scan. In fact, you can usually prune every user process off except for the root Explorer.exe process. anything with "(Verified) Microsoft Windows" in the Verified Signer column. Then fire up autoruns.exe and remove any suspicious startup entries. Heck, if you can, remove everything but the nvidia/ATI driver autoruns. Now run TFC.exe once more to make sure all the tempdirs are emptied. Alternatively, you can run an offline scan with a bootcd like AVIRA's Rescue CD -- the ISOs are updated weeklyish. AVAST's also a good option. Your best choice is to get Chrome, Chromium, or Firefox and load them with the Adblock and PDF Download extension that prompts you to download PDFs -- just click cancel if the prompt comes up unless you intentionally clicked a PDF link yourself. Myself, I use Chromium and Chrome Adblock. Chromium has an internal PDF renderer that doesn't rely on Adobe, and it's sandboxed by default. You can enable it from chrome://plugins/ which also will warn you if other plugins are not up to date. Still, it pays to be careful. # Search and replace subdomain.fqdn.com with your domain info. ### Redirect www to root domain? ### Redirect root domain to www? 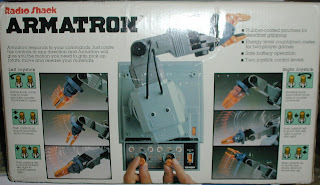 Super Armatrons rock in so many ways. 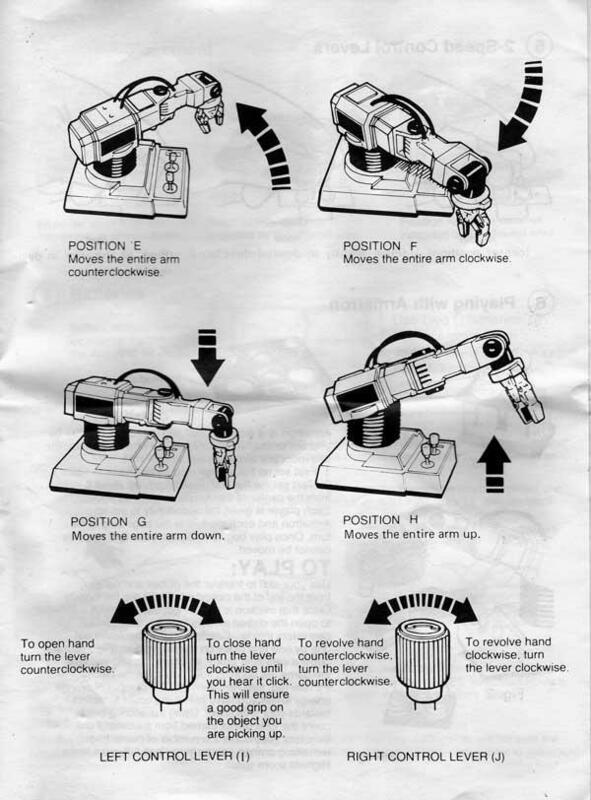 Every robot that you ever heard of normally employs some sort of individual servo mechanism for powering each joint of the robot. 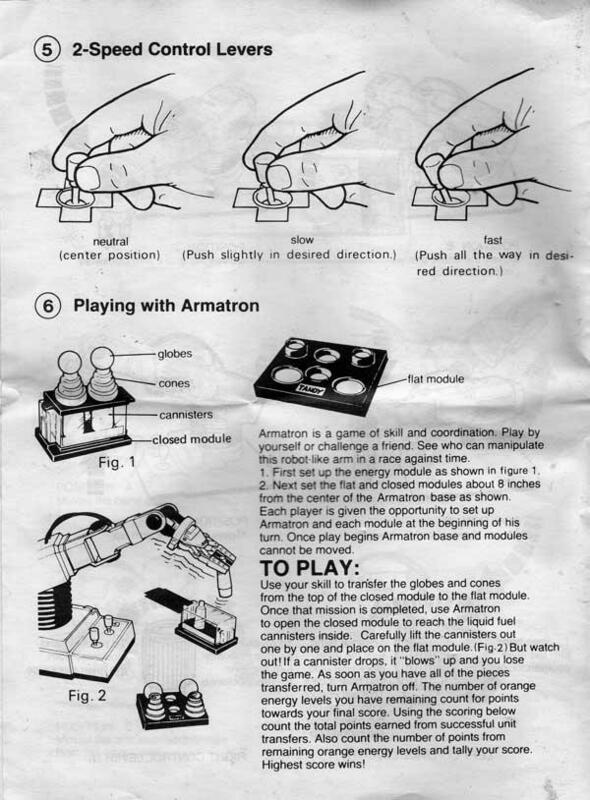 Not so with Armatron; There are no electronics inside at all, in fact the toy is entirely powered by a single motor. 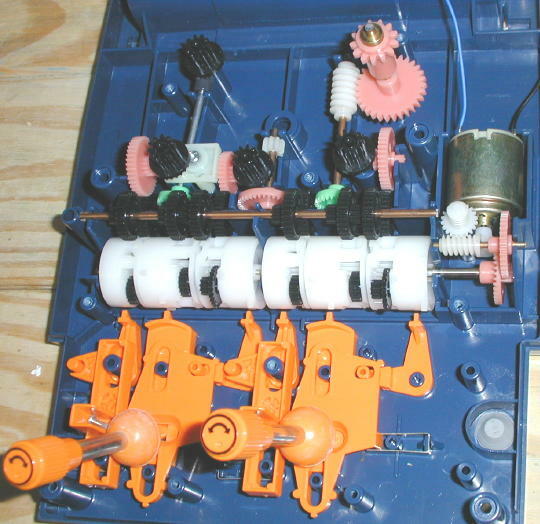 All of the toy's functions are controlled by a complex array of mechanical transmissions and gear trains. It's powered by 2 D batteries, directly connected to a power switch and a dinky brushed DC motor that looks to run around 300 RPM; it's very slow. Some clever folks have replaced the motor with a steam engine. 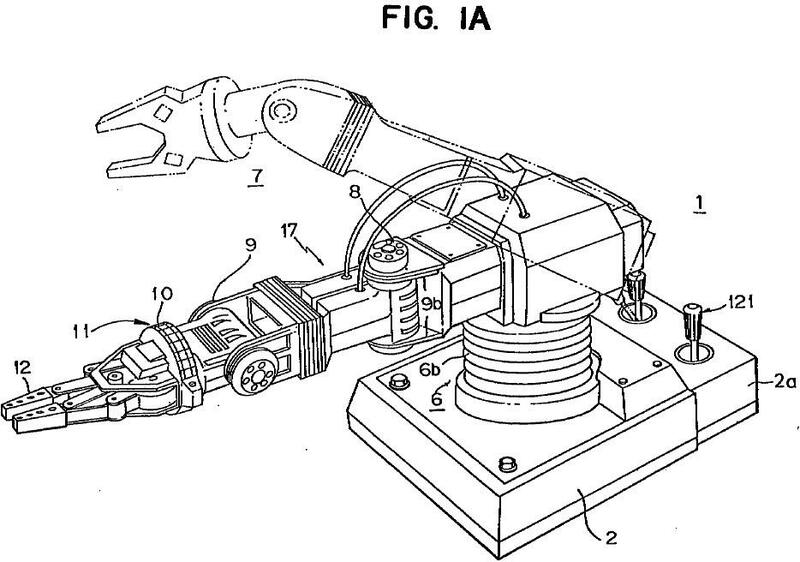 This toy has so many moving parts it almost defies verbal explanation. Shown above is an overview of the base mechanisms. 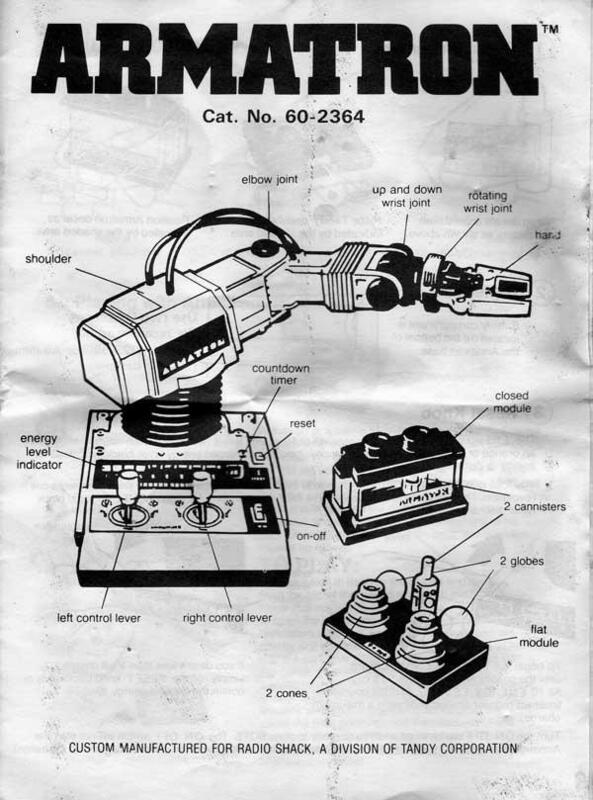 Each of the two joysticks can be moved up/down, left/right and clockwise/counter-clockwise for a total of six movements of the arm. Each of the six movements is bi-directional. 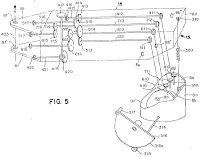 Four of the six movements are bi-directional with two speeds in each direction. 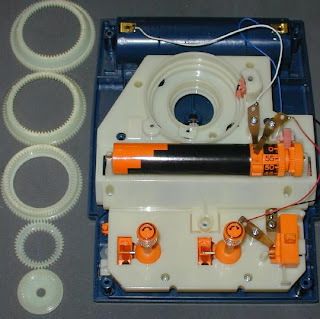 The joystick linkages (orange parts) control six transmissions (black and white parts). 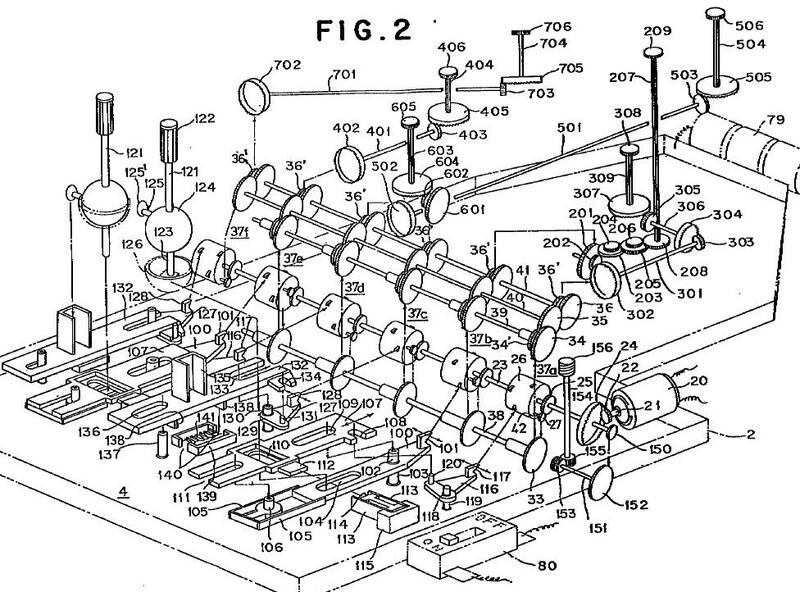 All the transmissions are powered by a single motor on the right. 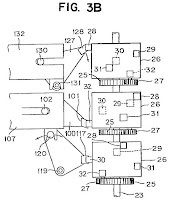 The gearing above the motor is for a timing mechanism described below. 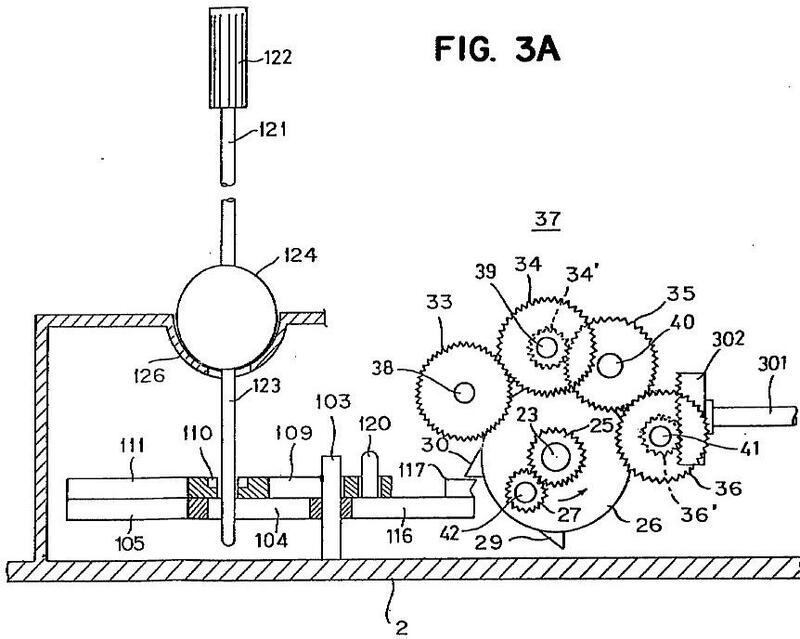 The gearing and shafting behind the transmissions connect the transmissions to a series of ring gears described below. 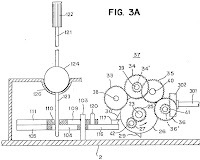 There are three sections to the transmission system: (1) a row of six black forward gears, (2) a row of six black reverse gears and (3) a row of six white indexing drums. 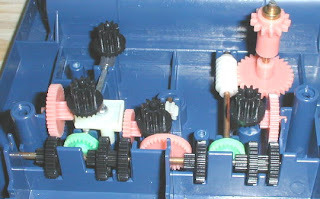 The picture above shows the lower row of forward gears without the other two sections of the transmission. 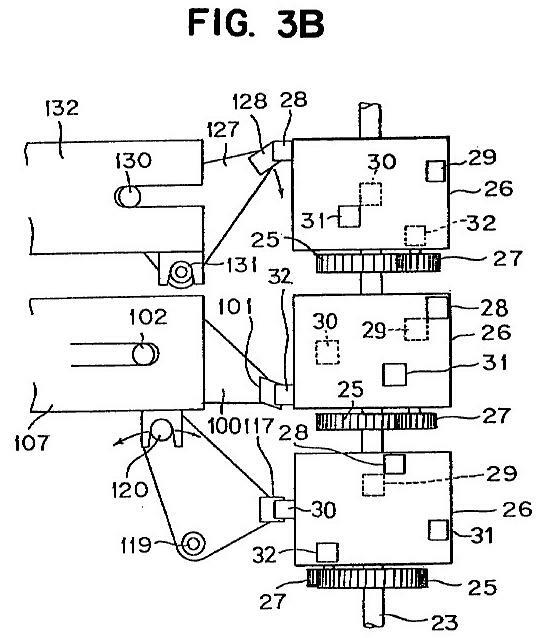 The picture also shows how the forward gears drive the output shafting. The picture above shows how the upper row of six reverse gears mesh with the lower row of six forward gears. The picture above shows three of the six indexing drums. 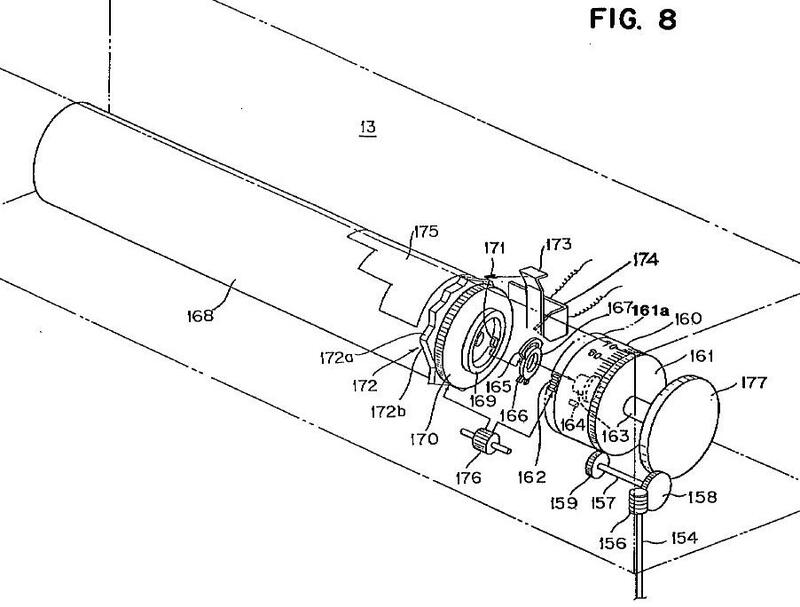 The red arrow indicates an inner gear fixed to the main drive shaft. 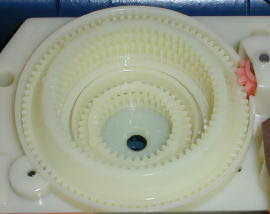 One of the outer black gears is for high-speed operation. The other outer black gear is for low-speed operation. 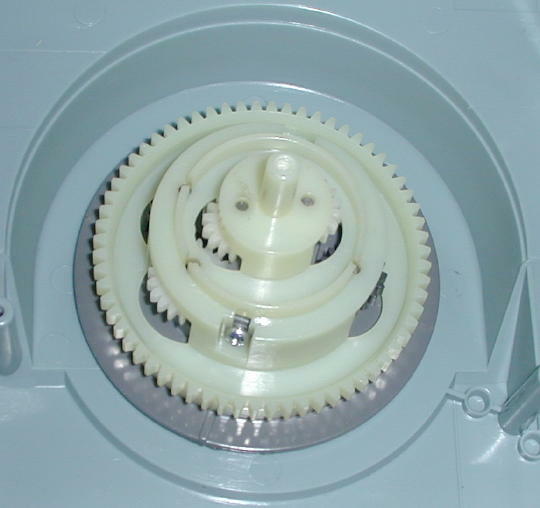 Friction between the gears causes the entire drum to rotate about the shaft unless the drum's position is held by one of five indexing tabs. 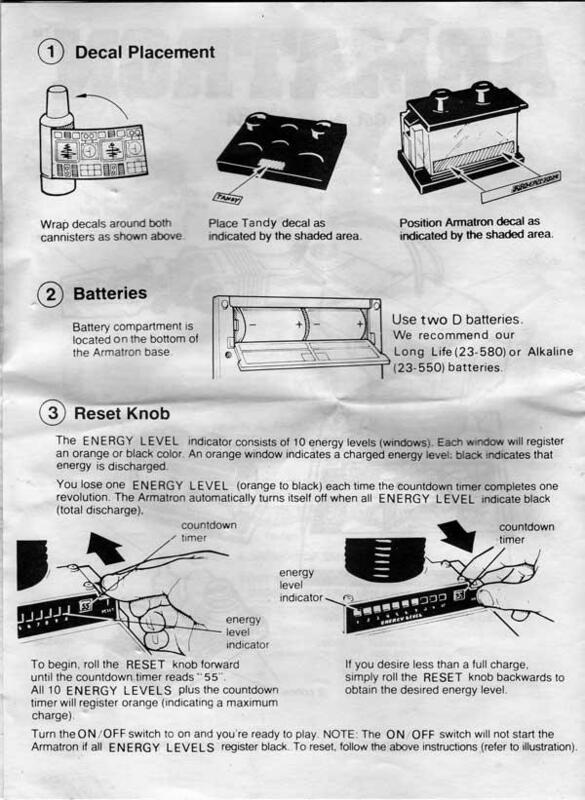 Green arrows indicate four of the five tabs distributed around the drum. The tabs determine which of the two gears on the drum engages the forward or reverse gear. The combinations are slow-forward, fast-forward, slow-reverse and fast-reverse. 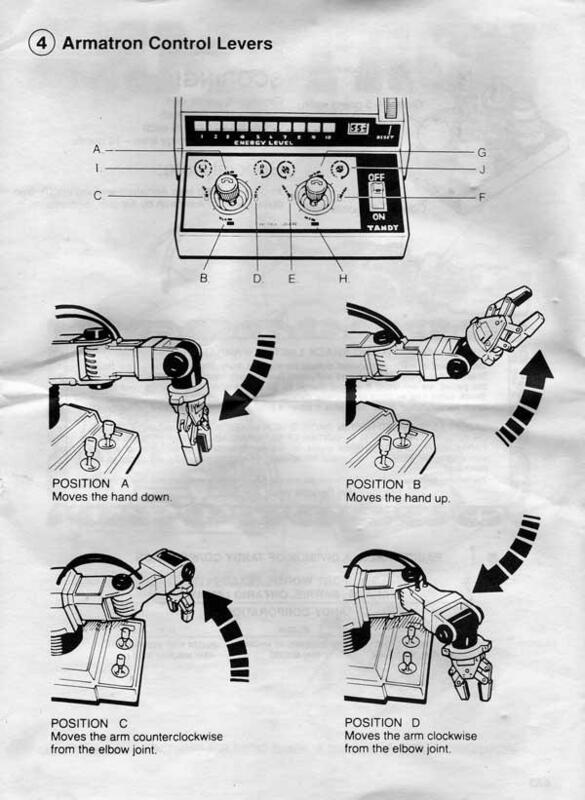 The fifth index is neutral where no gears are engaged. Note how the left drum is thinner and has only one outer gear. This corresponds to the claw movements, which have only one speed in forward and reverse. 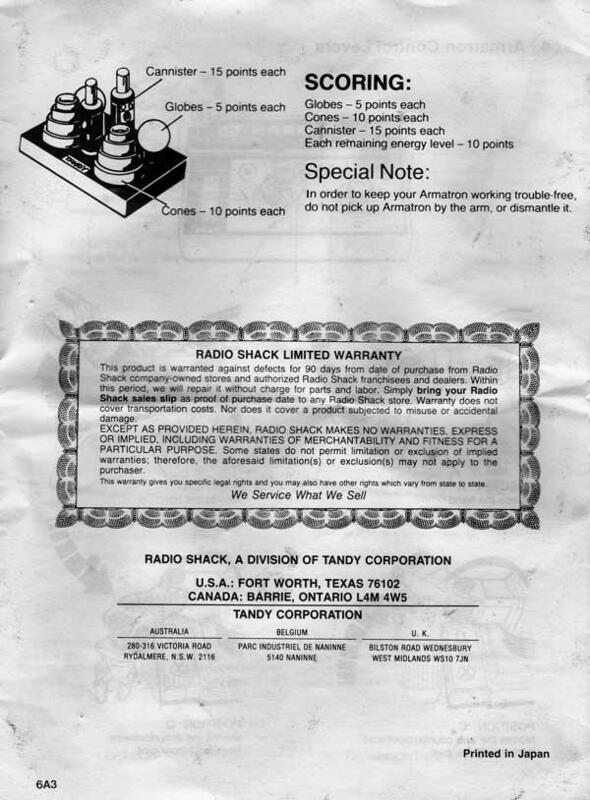 The images above show how the up/down movement of the right joystick controls the indexing of the rightmost drum. 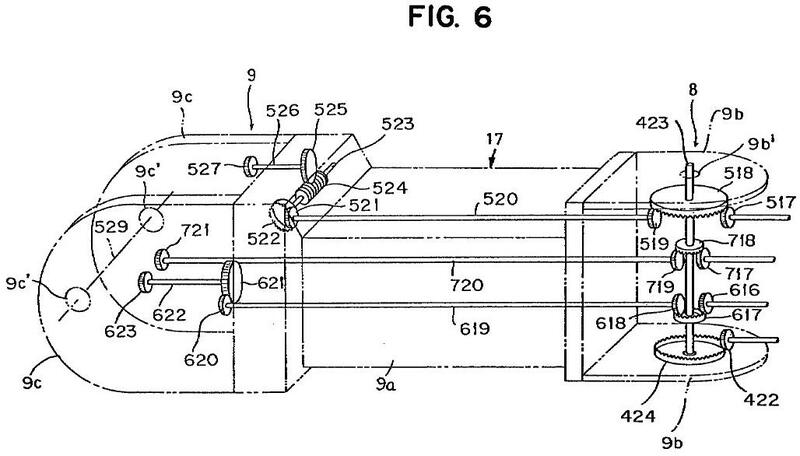 This corresponds to the up/down motion of Armatron's shoulder joint. 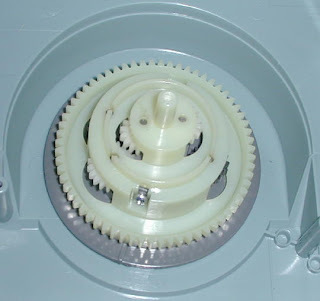 This picture shows the gear covers back in place. The arm assembly fits into the round ring gear socket. 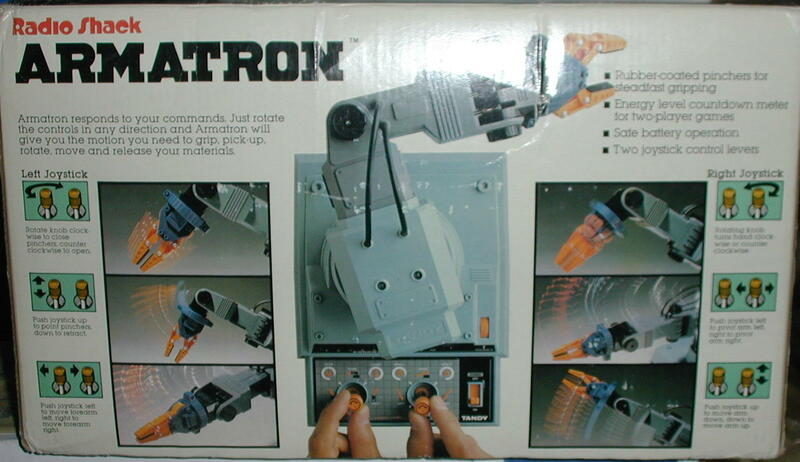 Armatron can continuously rotate through a full 360 degrees. This is made possible by the stack of ring gears. 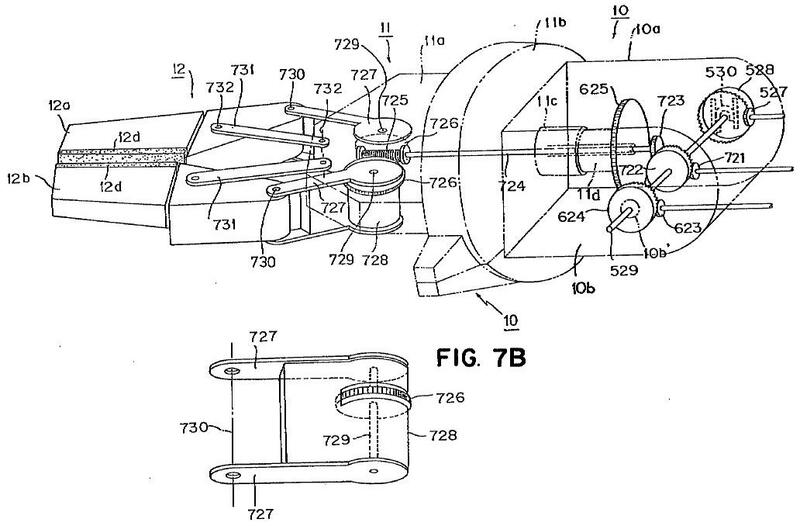 Each movement is transmitted from the base to the arm via a ring gear. 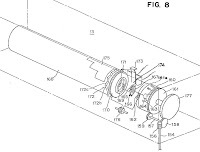 The orange and back barrel is a timer mechanism that cuts power to the arm after the allotted time has expired. 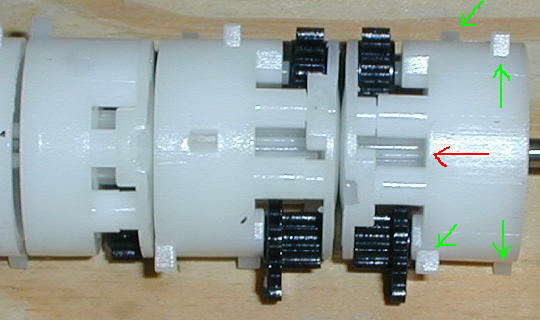 Here are all the ring gears layered back in the socket. 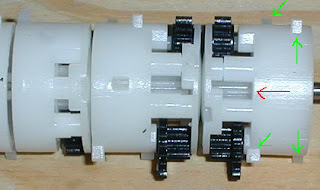 This shot shows the underside of the arm assembly that fits into the socket of ring gears. 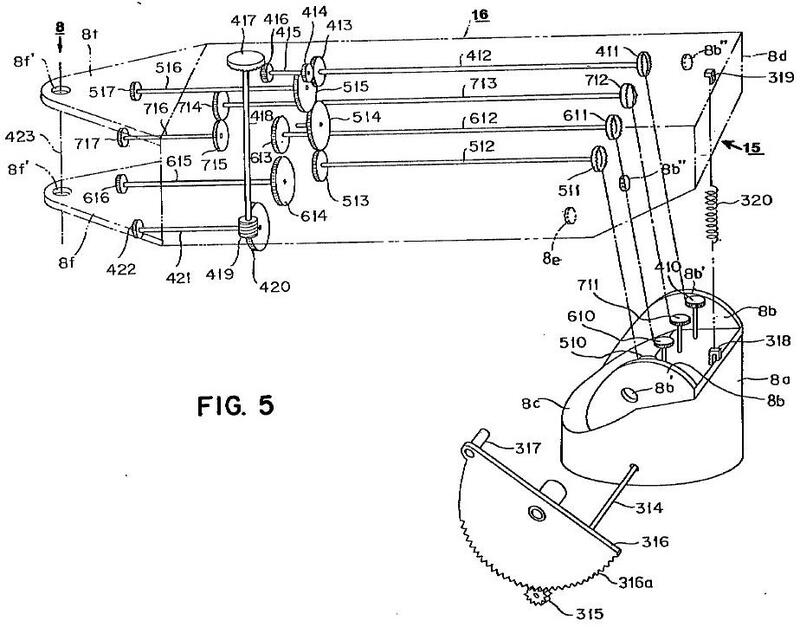 Here's some drawings of the mechanism ripped from the patents. Okay, so, I discovered some new stuff. First: nginx can be convinced to do close-to-automatic deployments. Now when you drop a new site into /var/www/sites your configuration will be picked up after an 'reload nginx'! Just rename the config folder to config-disabled and reload 'nginx' to disable a site. I'm sick of mySQL, Sun, and Oracle. Screw 'em all, time to jump ship to Postgres. Yay for Drizzle and MariaDB; keep up the good work and don't let The Man (Oracle) keep you down. Maybe I'll come back from the pg-side, maybe not. 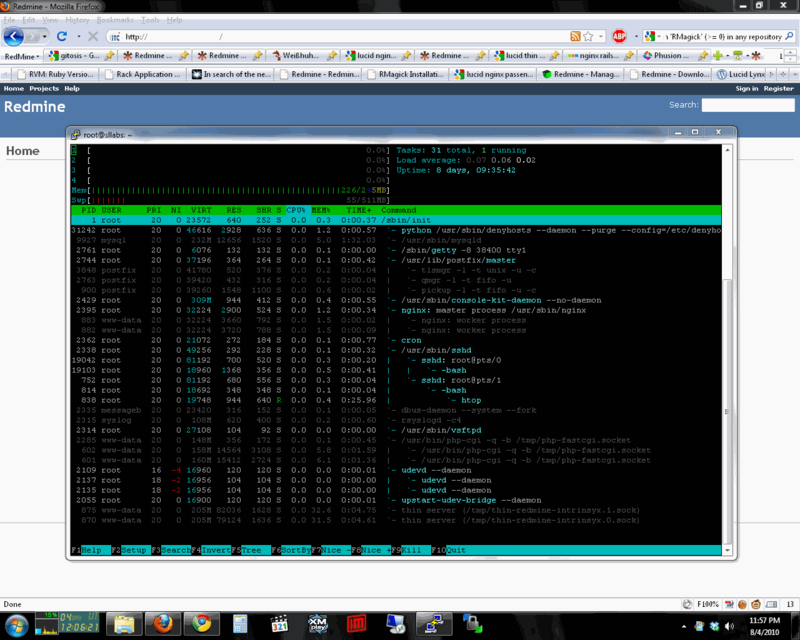 This is a little more involved to setup than mysql, due to the lack of dbconfig-common support requiring manual setup. and now all userids can login. Now, postgresql itself comes in a locked down config out of the box. Easy way to do this is to highlight the ipv6 line, hit Ctrl-K, the up arrow, Ctrl-U, then change the 'all' username to 'redmine_user'. And you should be set. Yesterday, it came down from On High. Bossman say 'We need a trouble ticket system.' and Kami say "yes massa!" A quick trawl of wikipedia's list later, and Redmine's the winner. Time Tracking, Revision control integration, and full RBAC + lockdown, and all written in my favorite language, Ruby. So, we'll be starting from where my previous post in the series left off. First: Get some required packages. Now set it as the default. If you want the optional gantt chart generation, you'll need rmagick. That will pull down a bunch of -dev packages; now build the native extensions. Now we need a better appserver than webrick. Let's go get thin. Decide on where you'd like the redmine app to live; I like the private directory under the hostname. Now, checkout version 1.0's latest revision. Edit the config/database.yml and configure the database settings. Now return to the redmine root (cd ..) and generate the session store. Now, we'll have redmine populate the database. You'll be prompted to choose a language here; just hit enter for english. Now visit port 3000. You should get a nice blank redmine instance. Next step: Setting up thin clusters on boot. Now we can add YAML config files in /etc/thin/ ! Enable your configuration and restart nginx. eBox 1.4 has support for serving a bootfile over TFTP. That /var/lib/tftpboot is where tftp will serve files from. gets replaced with whatever you've uploaded. But eBox won't set the dhcp-option 'filename' to serve it. Now we need something to boot. echo "Greetings! Hit Ctrl-C to bail out." echo "Going to DHCP on primary network adapter"
echo "Going to try http://netboot/default.gpxe"
echo "Didn't work, we're still here. Falling back to http://boot/default.gpxe"
echo "Didn't work, we're still here. Falling back to BKO"
echo "Here we go, off to boot.kernel.org!" echo "Didn't work, we're still here. No Internet connection? Falling back to next BIOS Boot device"
You should get a single .pxe file back after clicking Get Image. Go to DHCP -> Interface -> Advanced Options -> Thin Client. Click "Change" to complete the settings, then Save Changes. Place this file in the root of your HTTP server, named default.gpxe, and create a DNS alias to that machine named 'netboot'. Here's an example you can use to boot from iSCSI. As my few blog visitors may be aware, I've been using the U3 customizer for windows for a long time on my 4GB cruzers to make them bootable. I came across the u3-tool sometime ago when I bought my Clarion MiND, but I've only actually used it recently. The U3 Customizer tools were released somewhere in 2005 and won't work in anything but windows XP 32bit, and won't recognize U3s over 8GB. I just bought an open-box 16GB Contour EXtreme with AES from newegg for $40, and it came yesterday. So I started searching on how to hack a 16GB U3 drive. "Oh, right, u3-tool... Almost forgot about that!" In searching for 'how to use u3-tool', I ran across ubuntu launchpad bug report #534070 and played around a little. I had some issues trying to get the windows version to work, I could resize the CD domain, but 'burning' the ISO failed consistently at 4-5% with a scsi error. I was *NOT* able to get /dev/sg* or /dev/sr* to work -- I had to address the disk device itself as /dev/sdf to get it to work. Hope this helps others out, as I think the major problem people are having is trying to use one of the /dev/sg like the u3-tool help text mentions. 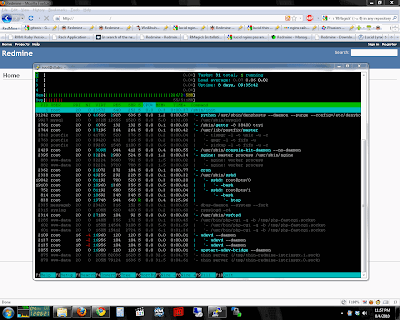 Here's the log of the CD domain resize and burn I ran. CD image(1874288640 byte) is to big for current cd partition(8060928 byte), please repartition device. I repeat: ANY EXCISTING DATA WILL BE LOST! After I changed the ISO, I also had to open Disk Utility (palimpsest), "Format the Disk" to create a new MBR geometry, and then create a new NTFS partition. Both sections of the device are now bootable, the CD boots ubuntu lucid 32/64 TORAM=Yes, and the flash boots the 7 preinstallation environment. So that all worked just fine for me. Hope it does for you, too! Today we'll be mangling us some web. 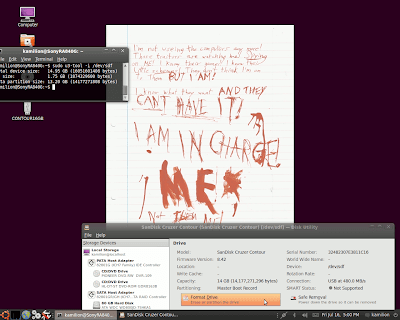 I've started off by installing a fresh copy of Ubuntu Lucid Server in Virtualbox 3.2.4. Mind, if you're using a Linux host, turn *ON* host caching in the "SATA Controller" if your host's using EXT4 as the filesystem your VDIs are stored on, otherwise it will try to use AIO and corrupt your VDIs. The host kernel needs a patch to fix this, but neither karmic or lucid have it, apparently. Anyway. For my first act, I've shuttled over my SSH public keys so I can use my agent to login. ssh kamilion@laptop # Say no or ^C to make empty ~/.ssh dir with proper perms! # No passwords! Get bent, crackers! AND edit /etc/denyhosts.conf to enable blocklist sync. This will sync the ssh blocklists from the denyhosts server. Uncomment SYNC_UPLOAD too, please contribute your stats! sudo rm /etc/init/tty[2-6].conf #Disable other TTYs because this is a VM. The virtualbox guest additions will use dkms to build the guest kernel modules automatically. You can select the Install Guest Additions from the vbox menu to insert the ISO into the cdrom. And set it up to startup on boot with upstart. The prestart tests the config; handy! and check port 80 for the default "Welcome to nginx!" response. you should get a working vhost with a proper config. So, we're now capable of serving static pages, what else can we do? Looks like we've got fastcgi, DAV, FLV streaming, gzip and mail-proxy by default. # security disclosure risk: shut php up -- hide version! description "php-fastcgi - respawning UNIX Socket"
Okay, now to start it. Now you'll need an nginx config. Okay, let's move on and install a real database. Doesn't really matter which you choose. I'm gonna go with mysql for now so we can use phpmyadmin later. Enter your new mysql root password twice. It'll ask which server you want to configure it for -- leave both apache2 and lighttpd disabled and continue. Yes, we want to use dbconfig-common. Enter your mysql root password for the first one; then just hit enter to have phpmyadmin generate it's own account and random password. Make some empty logdirs or nginx will go splat when it can't access them. You should now be able to access phpmyadmin and login with root/mysqlpass. phpmyadmin also can synchronize two mysql instances now, as well. SSH tunnels are your friend! Sync DBs over ssh with phpmyadmin! replace mysql-server.home with whatever hostname/ip has the mysqld instance you wish to sync with. You can pick any port instead of 33306, just make sure you tell phpmyadmin to look at "localhost" on that port. You can clone whole servers too! Want a remote mini-desktop? This'll take a couple minutes. Now, go forth and serve pages!